Rukh Shektan – young, fierce, and cunning – is thought to be the finest warrior produced by Caste Kumma – the warrior Caste – in generations. Proud and certain, he strides forth from Ashoka, intent on glory and the protection of his home. Karma, though, proves a fickle fiend, and Rukh stumbles straight into the heart of disaster. Discoveries are made. Buried truths and blatant lies are exposed, and secrets hidden away for centuries can no longer be ignored. 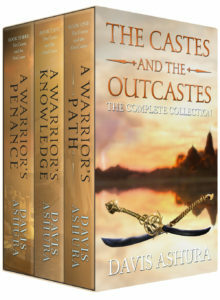 These secrets shatter Rukh’s future, tear asunder his Caste-driven society, and eventually leave him banished from Ashoka. Forced to journey into the unknown, the vast and deadly Wildness, his only companion is the agent of his downfall, a beautiful woman whose very existence should be anathema. There, in those hidden depths beyond civilization’s toehold, he seeks salvation, not just for himself, but for all of Humanity. For looming over the world like a storm waiting to break is Suwraith, the Sorrow Bringer, the demon who ended the mythical First World over two millennia ago. Her work is not yet done, though, for She seeks Humanity’s utter extinction. And She has a plan: Ashoka is to be shattered. But it is the Baels, Suwraith’s greatest warriors, who may hide the most meaningful deception of all.